Mophie has been the go-to battery case for lots of power users who can't get through a full day without it. The company makes a few different Juice Packs and the Juice Pack Plus has the highest capacity battery (2100mAh), more than doubling the battery life of your iPhone (it's rated at "120 percent"). It's sleek for a battery case (it also comes in red and white) and has come down in price dramatically from its original $120 list price. And the lower capacity Juice Pack Helium can be had for as low as $20 (that price may go up with the release of the iPhone SE). Just be warned that if you may have some trouble accessing the headphone port, particularly if your headphones have a larger jack - or an L-shaped one. Mophie does provide a headphone dongle that sticks out the bottom of the case and fits any headphone jack. It is easy to lose, however. Price: Around $40 on Amazon (or around $20 for Juice Pack Helium). The one issue with flip-cover or "folio" style smartphone cases is that while the front cover offers good screen protection, it can be a little cumbersome when you're answering a call or have the phone held up to your ear. Moshi's answer is the SenseCover, a new faux leather flip-style case that has a built-in window, along with touch sensors which allow you to answer phone calls, check the time, or turn off alarms without opening the front of the case. It's also worth mentioning that SenseCover also has a magnetic clasp that keeps the cover folded back neatly and out of the way when you do have the cover open. Magpul Industries, the maker of controversial firearms and firearm accessories, also puts its brand on iPhone cases. The MAG542 is an affordable, attractively designed case with a nicely textured finish and "PMAG-style ribs for added grip." Price: Starts at $5 on Amazon. A lot of people don't want to spend more than a few bucks on a case, and there are plenty of basic "no-name" cases available on Amazon in the $5-$10 range, including those from MiniSuit. When it comes to iPhone cases, you don't get much cheaper than this. Depending on what color you get (yes, it's available in multiple), you can pick one up for around $5 shipped (or less if you're an Amazon Prime member). Needless to say, this one's about as basic as it gets, but for a lot of folks that will be fine. Note: MiniSuit also makes a few other variations of this TPU case but they are all very similar. I've always liked Pad & Quill notebook style cases for the iPad and previous versions of the iPhone. 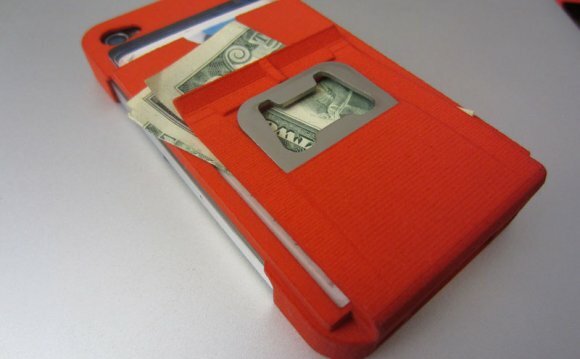 The new Little Pocket Book for the iPhone has the usual bamboo interior frame along with slots on the inside of the cover for storing credit cards and cash. A Luxury version is also available. I really like Pure.gear's Dualtek case, which is durable yet not too bulky. Its only small flaw is that the Pure.gear could have designed the cutaway area at the bottom of the case a little better. It's got a little too much play in it and could be stiffer. Available in multiple colors. Urban Armor makes this case in a number of different colors (they all have different names) and for a number of different phones. The translucent version pictured - the Maverick - is my personal favorite among the color options. U.K.-based Tech21 makes a line of Impact cases, including the Mesh. Some Impact cases are thinner and less expensive than others, but they're all pretty nice and come in multiple colors. The Ballistic Every1 case is one of my favorite tough cases. It's highly protective yet not incredibly bulky. It also has a built-in kickstand. Available in a few different color options but the black model is selling for less than $10 on Amazon (it started out at $50). The Belkin Flex is a pretty simple case, but it has a nice design. What's also nice is that it comes in a two-pack, and it's affordable at $20. Should be compatible with the 5S, but that hasn't been confirmed yet. Rocketcases makes a number of basic, retro-style cases, including ones that look like cassette tapes and Nintendo Gameboys. They're all affordable at $14.95 and some colors - white, for instance - cost as little as $5. Price: As low as $5 on Amazon. CM4 brings its Q Card case to the iPhone SE/5S. This one can actually hold both cards and money, as well as IDs, but be careful not to jam too much stuff in the wallet portion or you can end up stretching out the faux leather. Like a lot of these cases, I'd like to see this one cost about $10 less. Available in a few different colors.